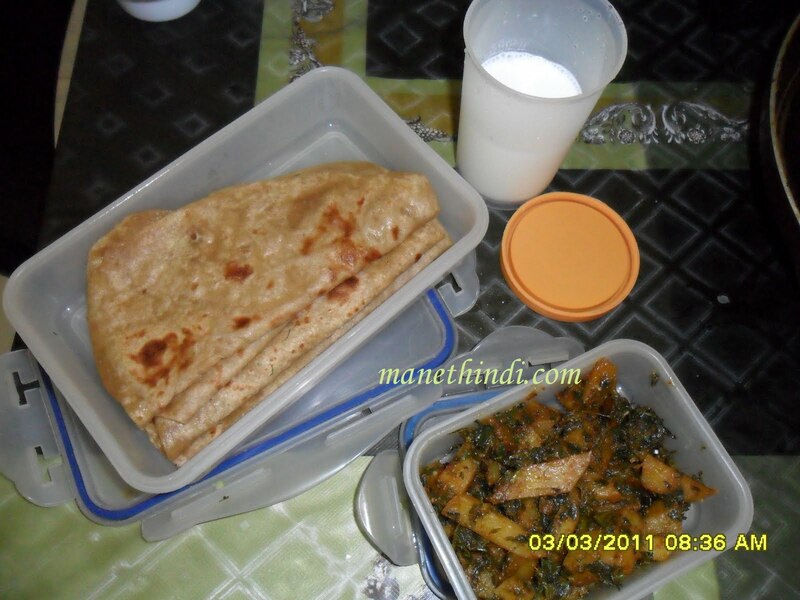 ALOO METHI - A lunch box idea! 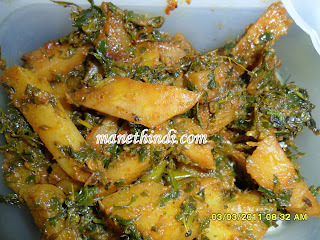 Aloo Methi is a quick curry or palya which is v nutritious and tasty too! Aloo takes in the flavours of its accompanying vegetable hence is a very versatile vegetable with loads of potassium in it. Methi or Fenugreek leaves has iron content and is a natural remedy for Diabetics. Hence all kinds of people - young or old, pregnant or elderly can benefit from this. This preparation is made keeping in mind a busy morning when we need to pack something sustainable but at the same time interesting! Check it out! Fenugreek leaves [Methi] generally has lot of mud on a fresh bunch. One has to clean it thoroughly by picking just the leaves, running it under water a couple of times until all traces of mud is gone. Frozen packets dont have that issue. It can be thawed directly. Cut potatoes into desired shape. I have cut into diamond shape. Length wise or chunky pieces also suit this curry. Keep it in cold water aside. Take a kadai [fry pan]. Add mustard oil - which has a strong flavour which goes well with this dish or any cooking oil. Once hot, add cumin seeds, hing, potatoes and green chillies. Coat the potatoes well with the oil and cover with a lid for it to fry well. When its half done, add the spices. Turmeric, Red Chilli powder, Aamchur and garam masala. You can increase the quantity of masala or spices if one wants it spicier. Now add the chopped fenugreek leaves and salt to the dish and mix well. You can sprinkle few water drops may be a tsp but not more than that as it tends to get soggy. This is a dry dish. Cover and cook for 3-4 mins in medium flame until done. Serve hot with Chapathis/Parathas/Nan/Puris. A dollop of thick yogurt or curds will balance the strong flavours of the curry. Note: As the title suggests, this is a lunch box idea. The Curry goes well with soft chapathis and a glass of buttermilk. Its very filling and delicious too! Am sure this is going to click with all the lunch boxes may it be offices or schools!